Use our FREE classifieds page to post any Jewish wedding related items you might want to sell, rent, or just give away. If you would like to list an item, please email the information and a picture to classifieds@chossonandkallah.com. 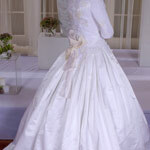 This is an elegant Eve of Milady special edition Amalia Cararra 2011 A21 ivory dress. It is hand beaded that shimmers beautifully under the light. Unique wide cathedral train that bustles up to a double French bustle. There are gorgeous buttons running down the back. Cleaned immediately after it was used. Elegant Designer "One-of-a-Kind" Paris runway Kallah Gown, Ivory Satin and Lace with Pearl Button detail, Tsnius Full-Length, Long Sleeved Wedding Gown with custom made bouffant lace dress liner, for Orthodox Chassanah in Beverly Hills, California. J. 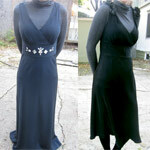 Crew long, navy and short, black silk dresses size 6 - perfect for Sheva Brachos. The long navy dress has a Swarovski beaded waist. The short black dress lambskin black ruffled pleats on the shoulders. Both are exquisite. Bought for $600, selling for $125. Beautiful wine colored tsniusdik dress that I wore only once for sale. Size 4-6. I just bought it about two weeks ago. It retails for $600 and I paid $200 more for alterations for buildup a little on the top... (The picture you see is before the buildup) Sale Price: $550. Email me if interested: msulimanov@aol.com. 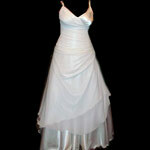 Gorgeous custom made wedding gown, sz 2, for sale (I was 111 lbs & 5'4" at my wedding), worn once. French lace, boned top (fully structured - do not need bra or corset) with 3-D applique flowers and rhinestones; half sleeves. 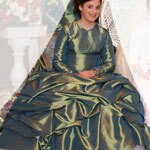 100% silk satin gown skirt (full A-line with folds of fabric)and train. 100% silk satin bronze, wide Monique Lhullier sash. Gown is an amazing champaign color. Includes veil & petticoat. Orig $6000. Asking $2500 or best reasonable offer. Have matching genuine pearl headpiece if interested - paid $350. Magnificent Kleinfeld designer gown size 8 tall. Worn only once. Paid over 7k; willing to sell for less than half or best reasonable offer. Call (if no answer, leave message). Exquisite designer gown by �MIRI Haute Couture�. Custom made with a beautiful lace on the top and an exquisite silk taffeta on the bottom and adorning the waste area. There is also an elegant detachable train. It is a size 10 and made for someone 5�6. It can be taken in or let out and can be shortened no problem. Worn only once and is in perfect condition! Incredible Offer! Contact Mirchyo@aol.com or call 718-954-5033 for more details. magnificent Mother/Sister of the bride gown for sale, worn once, perfect condition,100% silk tafetta and brown lace netting, Teri Jon exclusive, tznius, 3/4 length sleeves, brown and pink, stylish and elegant, beautiful detailing, A-line, very flattering, size 12-14!! Asking only 400$!!! Custom Needlepoint design for Tefillin Bags, Challah covers, Attara, Siddur covers, or any other needlepoint project. 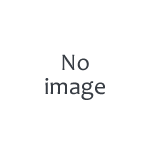 Email Handdone@aol.com, include your name and phone number. 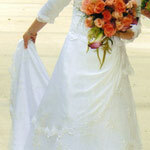 Be a part in the mitzvah of hachnasses kallah and donate your used wedding dress to help kallahs in Eretz Yisroel. Beautiful brown velvet and satin gown (worn once), size 8. For more information, please e-mail. I am selling an elegant yet stylish sister of the bride/bridesmaids gown. The gown is Size 4/6 and is made for someone between 5 ft. 2 and 5 ft. 5. The gown was worn only once. Gown is wine (mix between cranberry/burgundy) colored and has a thick coffee colored sash. Price is $400 or best offer. Please email me for pictures or more information.